The most famous application on any cellular platform today is WhatsApp. It has not only targeted teenagers but also people from late 50’s. Whatsapp is the best way to connect to your friends and family member. But it has its limitations; there is no much customization to WhatsApp available on Play Store. You can just change the background of chat room in the official WhatsApp. But there is something more than that of the original Play Store version. We have also reviewed WhatsApp Plus older versions 3.05 and 3.90 but now WhatsApp Plus 4.65D is rolled out. So I’m here to review the “WhatsApp Plus” the modified and latest version of WhatsApp which was introduced by many of the developers. Many of the android developer came together and worked hard on it to make a customize version of the WhatsApp. It is not announced by the WhatsApp Inc. and also not supported by it. We have published articles on this application but it had a update recently and we couldn’t stop our self from giving you such wonderful application. COLOURFUL – Basically it is a customizable WhatsApp where you can change lots of colors, sizes, and many other things. EXTRA UPLOAD LIMIT – In addition you can increase upload media limit (stock limit is 16Mb) to send large music files or videos. QUICK SHARE – You can share music just with one click. PARTIAL COPY/PASTE – You can select the part you want to copy from text rather copying whole text and send it to people in your contact. WATCH STATUS – You can directly watch status in the chat screen. HIDE PROFILE PICTURE – You can hide contact profile pictures and show phonebook pictures (in chat screen). LOAD OF THEMES – Built-in theme viewer and downloader. 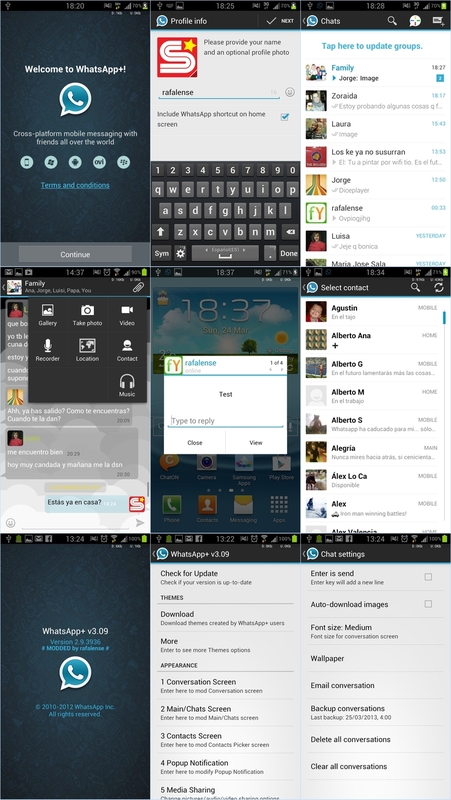 Check WhatsApp+ users themes online and apply theme if you like. HOW TO INSTALL WHATSAPP PLUS ? Delete or Uninstall the WhatsApp which is already available in your Device. Open the APK file and install the same in your Android smartphone or tablet. Now follow the screen instruction. Accept the installation with the “Accept” button. Congratulation, now you successfully installed the WhatsApp PLUS in your device. Note : This modified WhatsApp is not available on Google Play Store you can download it using our website.